255 Starner Bozeman, Montana – Your new 4-bedroom, 3586 square foot home awaits you at the end of a quiet road, in the heart of Gallatin Valley, with epic views in all directions. The home, sited on 5.2 fenced acres, is quintessential Montana, beginning with its setting encompassing wide open skies and fertile farmland framed by the Spanish Peaks and Gallatin Range. The custom ranch-style home incorporates natural materials and rustic touches, including the use of hardwood floors, plaster walls, timbers and stacked stone to add to its overall appeal. The home welcomes you the moment you see it. The exterior is pale dove-grey wood lap siding, accented with timbers, natural wood soffits, wood trim around the gray-clad windows, and clean architectural lines. 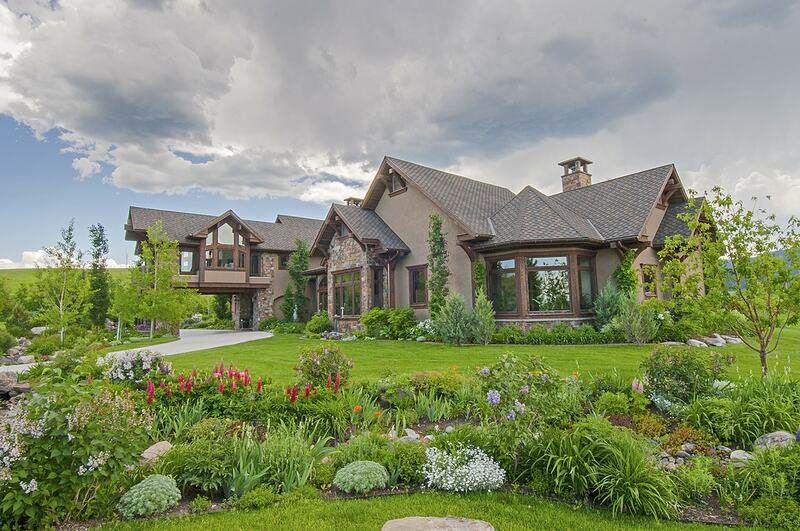 The home blends with the surroundings and is set off with native landscaping, lawns, meadows, and hayfields. The home is easily accessed by a generous paved circular drive leading to both the front door and the 2-car, extra deep, heated garage. A covered front porch, with vaulted wood ceiling and stone and timber pillars, invites you in as you pull into the circular asphalt driveway. The home, built in 2004 for a manager of Montana Sash & Door, has impressive 8â€™, solid alder wood doors and quality hardware throughout, as well as picture windows in every room capturing the 360-degree views. The massive, solid-wood, front door, bookended with glass windows, opens to a generous foyer featuring Montana slate flooring, which is also utilized in the powder room, back laundry and mud room. The present owners did a major remodel/upgrade of the home which included installing wood flooring throughout the entire rest of the first floor. Designed for main floor living, the homeâ€™s open floor plan begins in the foyer, which connects to the living room portion of the Great Room in the west wing and the wide hallway leading to the 3 bedrooms in the east wing. The living room is anchored by the stacked stone gas fireplace on one wall and an entire bank of south-facing windows with east and west side windows. The tall vaulted ceiling and abundant natural lighting creates a sense of grand roominess, while the fireplaceâ€™s stone hearth is cozy. The gourmet kitchen and dining room are open to the living room while still retaining their own character and functions. The angled kitchen island, with granite counters matching the main counters, and a bar sink, has generous bar seating for 4 with a raised wood-top counter. Alder cabinets are used throughout with a honed travertine marble brick-style tile for backsplashes. There is an attractive inset mosaic marble detail in the backsplash between the 4-burner KitchenAid range and the exhaust system. The stainless appliances include a KitchenAid dishwasher and Whirlpool French door style refrigerator. A side wall, built-in desk area with honed travertine backsplash has upper, glass-fronted, display cabinets and a built-in wine holder. The kitchen includes a large walk-in pantry with access to the mechanical room. A front office is located between the foyer and kitchen with French doors with smoked glass panes creating an impressive entrance. There is a lovely view of the Bridger Mountains, a seating area, and built-in alder cabinets and desk. The Master Suite and two additional bedrooms are in the east wing insuring privacy from public spaces. The large master enjoys southern exposure, a corner gas fireplace, and a bathroom fit for a spa. There is a glass fronted, tiled steam shower, a jetted tub enclosed in a porcelain tile deck with towel cubbies, double sinks inset in a creamy granite slab, and a very spacious walk-in closet with wood flooring and upper windows. The two other bedrooms are roomy, have deep, ample closets, nice view windows and share a bath that has cream-colored porcelain tile flooring matching the master, along with double sinks set in a cream granite counter. The tub/shower combo has tile backsplash walls. There is an alder wood credenza built in to an alcove in the wide hallway. The mud room and laundry area connect the 2-car, heated garage to the kitchen. Large coat closets, a built-in bench, and a deep utility sink add function, along with the slate flooring. A wood staircase with carpet runner leads to the upper floor â€œbonusâ€ room. This carpeted, air conditioned, very spacious room has enough room to create a kitchen area within what is now a great room/bedroom with south and north windows. This could be a separate apartment and is already an ideal guest room. The full bath has east-facing windows and an inset shower/tub. This is a home meant for outdoor enjoyment and entertaining. With a location this private, pastoral, and stunning, you are going to want to be outside, and in every direction, there are not only views but places to enjoy them. The kitchen door opens to a covered deck, perfect for cocktails, meals, and watching the sunset. The glass living room door connects to a south and east facing entertaining patio and the hand-cut flagstone path leading to the fire pit, placed within a circle of flagstone patio and dramatic boulders. Is anything better than your own slice of heaven to embrace a starry night, watching satellites and locating constellations! Your pets will also love this property. A garage door connects to the dog kennel (which also has kitchen deck access) and adjoining ½ acre dog run. Thereâ€™s a fenced pasture ready for a horse or two, and even a fenced, raised-bed, vegetable garden in the front side yard. Whether you love contemporary and modern furnishings, Mission style, traditional, or rustic, the interior palette and style of this home is neutral in a manner that lends itself to you creating your own statement. Convenient to downtown Bozeman, Four Corners, the airport, and ski days in Big Sky, this property is in move-in condition, with an underground high-speed fiber optic internet. The phone, electric, and gas lines to this property are also buried, so nothing comes between you and the view. View 255 Starner Listing HERE.